Many of the up to 80,000 people visiting HafenCity every day will be attracted by its many shops, eateries and other services. Some will be rushing to shop for everyday needs, others taking their time over some retail therapy, or coming to meet friends for a drink or dinner; some may be due at the hairdresser, or for a doctor’s appointment. A quick trip to HafenCity will become as normal to both Hamburgers and tourists as window-shopping is now in the existing city center. In future the 45,000 or so people working in the neighborhood and 12,000 residents of HafenCity will be mingling with a growing number of visitors in the shops, bistros, cafés, restaurants, galleries and exhibition spaces by day and by night. Most publicly accessible uses are located on street-level floors. This guarantees an urbane big-city shopping experience; it was a conscious decision not to have a shopping mall sited in the central Überseequartier quarter, for instance. In some places, space is also available for food and drink outlets down a level in basement floors. Bistros, cafés and bars are then located right next to popular promenades and squares. If the weather is kind, restaurateurs open up their outdoor terraces - an inviting opportunity to relax after an exciting but tiring shopping expedition and enjoy picturesque views of the water. There is also a rapidly expanding range of eateries offering gastronomy from the widest variety of countries. In Überseequartier, the first and sometimes even second floors are planned for shops, restaurants, cafés or bars. 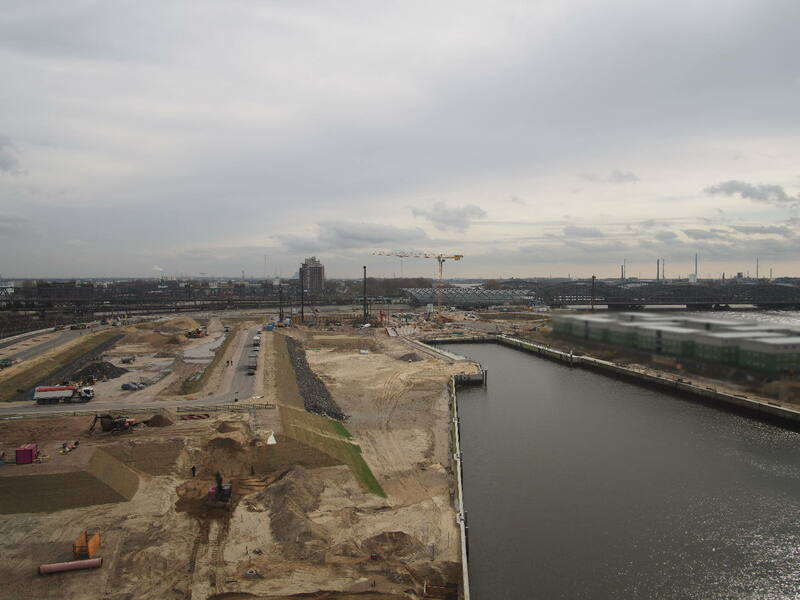 This, the heart of HafenCity, will be its main magnet for the public, attracting around 40,000 visitors by day. Überseequartier alone offers some 68,000 sq. m of gross floor area (GFA) for retail and catering. In addition to flagship stores and branches of international designer labels, there will be brand boutiques, as well as innovation outlets, for which generous space is available. This type of retail concept has yet to be realized in Hamburg or indeed anywhere in Germany: such retailers can seldom open in top-quality and high-rental inner-city areas; Überseequartier now offers them an attractive environment in which to realize their ideas. Although shops and eateries are mainly concentrated in Überseequartier, plenty of ground floor space has also been reserved for shops, restaurants, cafés or bars in other parts of HafenCity. But they are differentiated according to neighborhood and location: on Dalmannkai, for instance, which is mainly residential, a fine-grained mix of shops on the spot already serves the needs of residents and people working there. Some shops, restaurants, cafés or bars are wholly integrated into the building or neighborhood surrounding them: thus the ground floor of design center designport hamburg, for example, accommodates a design shop, among other outlets. By using ground floor space to house a Dove Spa, Langnese ice-cream parlor and another brand outlet, consumer goods group Unilever on Strandkai opens itself to the neighborhood - and its customers. Meßmer Momentum on Dalmannkai opens the door to the world of tea - one of several projects mirroring the area's history as a global trading center for tea and coffee. Opening in the International Coffee Plaza on Sandtorpark, for example, will be various cafés, roasting outlets, fine food shops or retailers of high-end espresso equipment. Retailers and food and drink purveyors are thus as innovative as many other users in this part of town. HafenCity is not only increasing the range available in the city center in quantity terms, it consistently raises the bar in quality terms.